This Christian movie has such an excellent cast starting with the amazing Reese Witherspoon who does an amazing job in leading the movie. Also, I love the topic this Christian DVD shows a light on. The Good Lie was produced by Ron Howard and by far has been nominated for several awards along the way. The Good Lie is based on a true story of the Civil War that occurred in Sudan which in my opinion makes the story even more powerful. The Good Lie is about a group of refugees from Sudan who actually get the opportunity to settle in the United States, specifically in Kansas City, Missouri. There they meet an employment agency counselor that changes their lives forever. 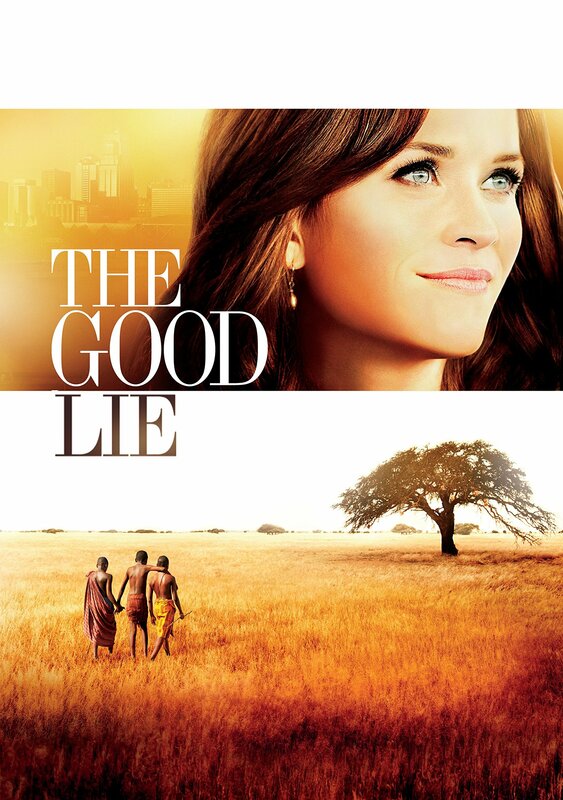 The Good Lie quickly lets the audience know that the Second Sudanese Civil War has occurred and we meet six siblings whose village and family members have been horribly killed during an incident. The names of these six siblings are Daniel, Mamera, Theo, Jeremiah, Abital and Paul who all escape and now try to look for a new place to live. For the days to follow the siblings go through several traumatic situations as they are wandering through the woods and looking for shelter from all the threats that constantly surround them. After wandering for a long time, the siblings meet a group of refugees but this happy meeting is cut short when another horrible incident occurs taking the lives of more people. One of the siblings, Theo, is captured. Later on, in The Good Lie, they find shelter in a Sudanese refugee camp and are located in Kenya. During this time in Africa, Daniel gets sick and passes away suddenly. In the shelter in Nairobi Kenya is where they stay for more than ten years but one day their names are drawn in a lottery to relocate somewhere else. To the siblings’ surprise, they are chosen for relocation but to the United States, where they can look for a job and start a new life. Now in New York, the fours siblings left are separated as Abital is taken to Boston to live with a family that will host her in their home. Now there’s three brothers left, Paul, Jeremiah, and Mamere, all alone in the big city of New York. The brothers are sent on a plane to Kansas City where they meet Carrie Davis (played by Reese Witherspoon), a full-time employment counselor. She’s assigned to place these boys on a job and she works endlessly to make that happen. She wants them to find a job but also to feel comfortable and adjusted in the United States. Jeremiah from this Christian movie begins working in a grocery store and also as a Sunday school teacher in a local church. Paul, on the other hand, finds a job in a factory but is struggling with the transition as he meets fellow employees who are frequently using drugs while on the job. Last but not least, Mamere finds multiple jobs, for example, he works as a security guard but also he finds a job working at a store. His goal is to get as many positions at his jobs so he can gather enough money to attend medical school. He’s always wanted to become a doctor and now being in America gives him the opportunity to achieve it. Later on in the Christian movie The Good Lie, the three brothers are able to bring their sister Abital to Kansas City and are finally reunited with her but their other brother Theo is still back in the Sudanese refugee camp. They all share a small spark of hope that he’s survived all this time but also a part of them fear the worst, that he is already gone. Soon Mamere receives a mysterious letter which makes them think that Theo may still be alive. Now the question is, will Mamere go back to the Sudanese camp to look for Theo and separate from his siblings in the U.S.? Even though such a hard decision, Mamere chooses to go back to the Sudanese camp with hopes of reuniting with Theo and going back to America so he and his siblings could be together finally. But will they be together again? Find out by purchasing the Christian Blu-Ray The Good Lie on the Fishflix store.